There are few places I’d rather be, than poling a flat in search of a prize redfish or rolling Tarpon. It’s aroma, mystique, and variety of fish keeps me and other anglers coming back each week. However, as beautiful and exciting as saltwater can be, it can also be very harsh on your gear. In this month’s pro tip, I want to focus on how to properly flush the vessel’s engine. This maintenance tip, while being simple, plays a vital role in the longevity of the engine. Marine engines are water-cooled. This means that while the engine is running, it is using a water pump to take in water that cycles through the engine to cool it and maintain an even temperature. With that being said, as we run our boats in saltwater, the water pumps are taking in salty water, which is extremely corrosive. Therefore, flushing the motor with fresh, clean water is an absolute must. Flushing the motor can be done a few ways but first, determine if the engine comes equipped with a flushing port. (Please note that a flushing port is not needed and even if equipped, does not have to be used) A flushing port is simply a factory-installed version of earmuffs for engines. 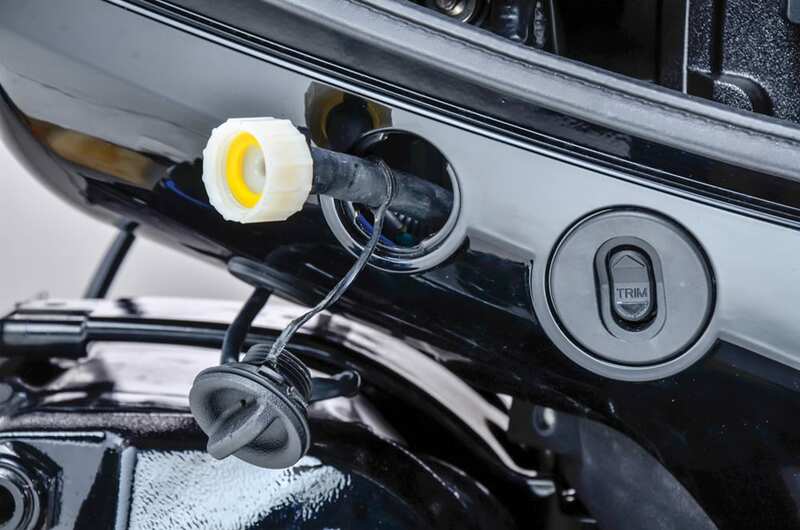 1) Most flushing ports have a cap that is threaded into your engine. 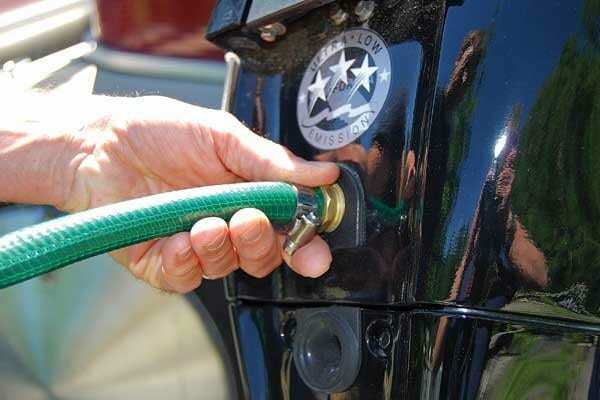 Remove the cap and attach your hose to the flushing port. Refer to the owners’ manual to locate the flushing port. 2) Turn on the water and allow it to flow 10 minutes. Again, check your owners’ manual to find out specifically if you should run your engine at idle while using the flushing port or not. 3) Remove the hose, and if needed, replace the cap. 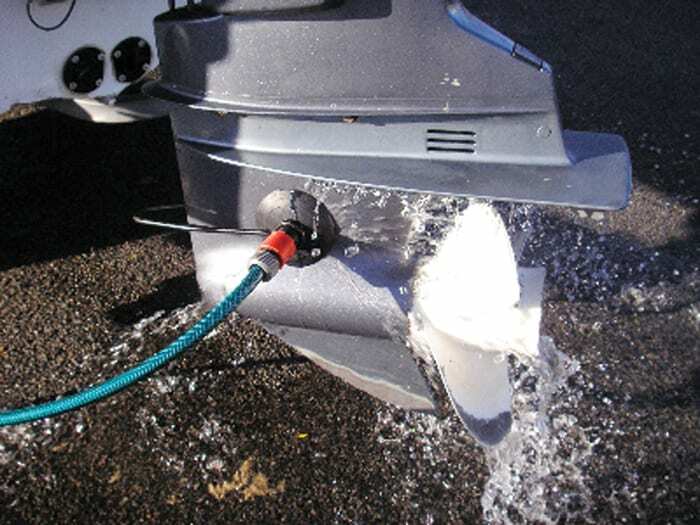 I prefer to keep the engine trimmed all the way down, so that all the excess freshwater can drain out. 2) Once in position, turn on the water and confirm that the intakes are still covered. 3) Start the engine and let it idle for at least 10 minutes. 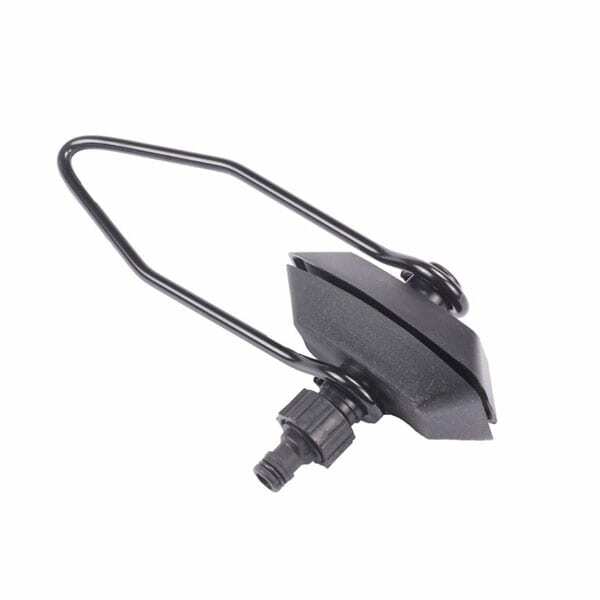 This allows the engine’s thermostats to open and temperature to rise and regulate. Also confirm that water is flowing out of the tell tale (pee stream) as this will insure that fresh water is being pushed through the engine. 4) Shut off the engine, shut off the water and remove earmuffs. Again, after removing the earmuffs, I prefer to keep the engine trimmed all the way down, so that all the excess freshwater can drain out. A third option and my personal favorite, is to take my skiff to a nearby freshwater lake. This option allows me to flush my engine while rinsing off my trailer. This can be accomplished by parking on the ramp. PLEASE keep in mind that this option should only be done if you are not blocking the ramp for others to use.